The young queen Aerin saved the kingdom twice already. But now the elven kingdom is threatened by new danger: the Duke von Gross from the western land wants to take the kingdom of elves and enslave them. Will Aerin be able to rescue the kingdom this time? Interesting encyclopedia of creatures and collectable items! 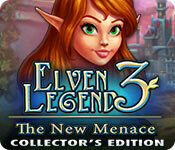 Elven Legend 3: The New Menace Collector's Edition is rated 3.4 out of 5 by 14. Rated 5 out of 5 by amgood49 from Awesome I really enjoyed playing this one also. am not sure what all the complaints were on waiting for items to fill they went fast. I didn't play the hard but the medium one so it was still timed. liked all the new things they did with the game. Watch your secret items, they do strange things. wont tell will ruin it for you but on the hunt for one of the hidden items I can't find. enjoy its great. Rated 5 out of 5 by Braidweaver from Worth the Challenge Time Management Games are my favorites, and this one was ultimately an excellent example. Unlike many TM games, there are many levels here that require a lot of repetition to achieve the highest ratings, and strategy requires a careful balance of click sequence and use of power-ups. Often the order in which resource generators are built and the timing of upgrades are critical. Initially, I made the decision to play as well as I could and settle for two stars after level 14, but I kept being drawn back to the game and eventually scored three stars on each level. The Collector's Edition Levels were far easier than the last 10-15 regular levels. There is a Strategy Guide within the game but it doesn't give you enough hints to spoil the challenge. I'm glad I purchased this game! Rated 5 out of 5 by pennmom36 from So Much To Do So Little Elven Time I love the graphics this Time Management game offers, and each level has really good layouts with plenty of active areas to interact with. This isn't an easy breezy game however (unless you are playing in Relaxed mode which is untimed) and I will admit that I had to restart a few levels to "get it right" by slightly altering the order in which I queued my tasks, otherwise I had to waste time waiting for the necessary resources to be available because I used them on a different task that had more benefits. You can earn up to 3 stars in each level, and you will have to use strategy to earn all three stars. The goal is to help Queen Aerin find the thief that stole the evil witch Mortessa's Diadem and return this dangerous artifact. Each level has a hidden Book to find and some levels have a Morphing Statuette, which I thought was cool. 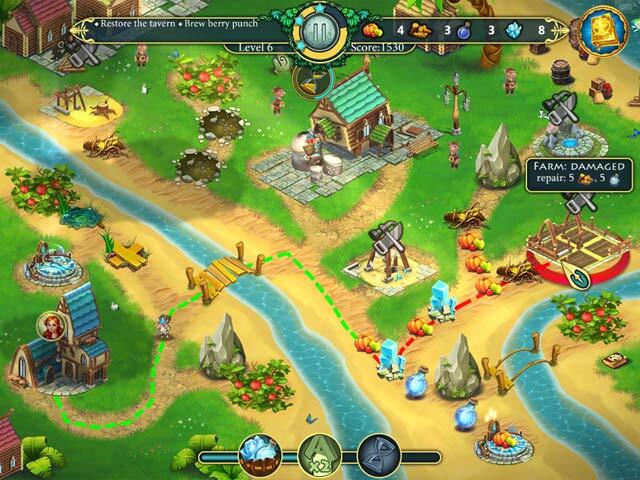 There are the normal resources to collect, food, wood, stone etc. and the same tasks of clearing the roads, repairing bridges and filling in pits along the way. Queen Aerin will do all the magic work, once she has enough magical crystals to charge her staff, and her trusted Griffin has joined her on this adventure as well. 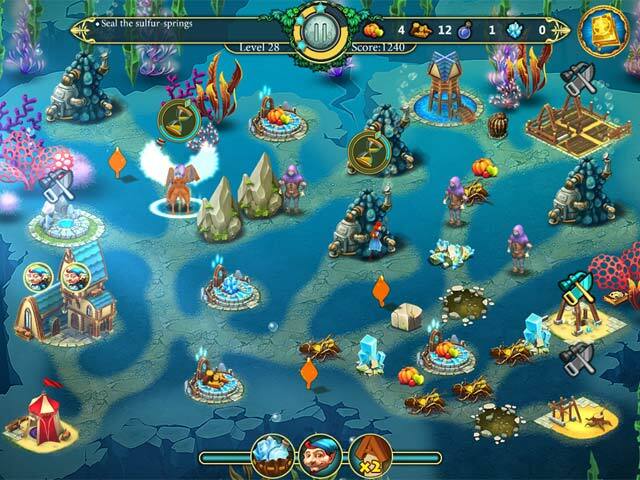 There are several Altars of Resources available in each level that will produce resources over a period of time and each level has a Bonus meter that recharges to give you temporary boosts such as faster workers, more resources, or extra workers. This Collector's Edition has 9 Wallpapers, 6 Concept Art pictures, 6 Hidden Objects, 50 Collectibles, 8 Character Encyclopedia bios, a built in Strategy Guide, 40 Levels & 10 Bonus Levels, 38 Achievements, High Scores and a Bonus Chapter, enjoy! 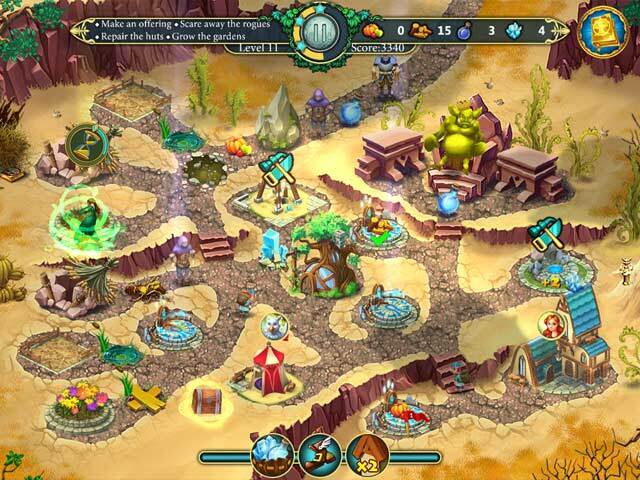 Rated 5 out of 5 by peg77 from Love This Game!! Love this game! I bought the first two Elven games and will also buy this one! Rated 4 out of 5 by DrDavid from Simple fun; not anything serious This was not a particularly hard game but it was fun and I could play for a while and then do something else. I went through it once and decided to go back and replay it. It sort of fun just to watch the characters running around. Nothing serious here, but a game to enjoy without getting absorbed by it. Rated 4 out of 5 by brimaz from Welcome Back, Aerin! I like the game (I have both previous games) but there are a couple of things I'd like to see before I spend the money on a collectors edition. First, I don't appreciate the slightly fuzzy graphics. There's no excuse for it, and it should be cleaned up immediately. Second, I'd have liked some different characters to add more interest to the story. It probably gets better in later levels, but having played to level 14, there were only a couple. Having said all that, I'll buy the game when the standard version is released. Rated 3 out of 5 by NBliving from I like TM's So this got a low rating from me for a couple of reasons, first the game tells you about keeping your 'star level high' great love something to compare to, except there were no stars. Second, even though I had the game hints on, it didn't tell me about what to collect until I had found the items by accident. This is a no buy for me. Rated 2 out of 5 by annieliz1 from Moai I cannot seem to get into this one. I enjoyed the first game; second game wasn't bad but we seem to have another example of the "first good game" syndrome which is followed by not-so-good further games which are not put together as well. It seems very wooden and you just have to follow the game by stilted steps. Queen Aerin saves her kingdom from a new menace – evil Duke von Gross.